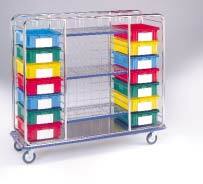 Combinations of wire shelves and/or plastic storage bins provide a variety of storage solutions. 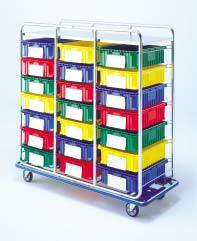 The tubular frames are designed for strength and versatility in everyday use, incorporating a steel dolly base. In. Mm Lb. Kg Cat. No. 1 dolly base w. wraparound bumper and stainless-steel bottom shelf. 3 adjustable nickel chrome wire shelves. Back screen 3’’x3’’ (76x76mm) mesh. 14 drawers (dividers: 1 long, 2 short and index pockets included). 4- 6’’ (152mm) casters: 2 swivels, 2 rigid. 1, 2, or 3 Stacks of Drawers: High Capacity Storage, Small Footprint! drawers, drawer dividers (1 long, 2 short per drawer) and index pockets. standard 5’’ (127mm) plate casters.